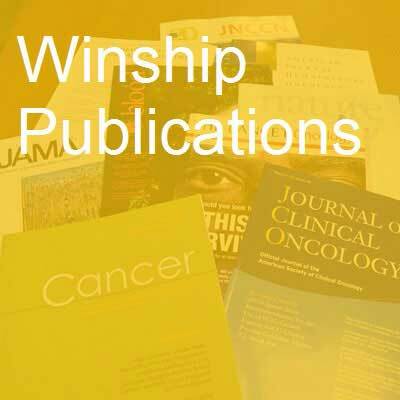 Various first authors and senior authors from Winship Cancer Institute have published 64 studies in major medical and scientific journals in the past month. Changing Landscape of Radiotherapy for Melanoma Brain Metastases, in Light of Newer Targeted Agents and Immune Checkpoint Inhibitors. Khan MK, Curran Jr WJ. Journal of oncology practice / American Society of Clinical Oncology. 2016; 12(6):543-4. PubMed PMID: 27288471. Conditions for valid estimation of causal effects on prevalence in cross-sectional and other studies. Flanders WD, Klein M, Mirabelli MC. Annals of epidemiology. 2016; 26(6):389-394.e2. PubMed PMID: 27287301. Determining Consistency of Surrogate Decisions and End-of-Life Care Received with Patient Goals-of-Care Preferences. Song MK, Ward SE, Hanson LC, Metzger M, Kim S. Journal of palliative medicine. 2016; 19(6):610-616. PubMed PMID: 26982909. Expecting the Unexpected. Antun A, Kempton CL. Journal of oncology practice / American Society of Clinical Oncology. 2016; 12(6):533-4. PubMed PMID: 27288469. Foreword. Green VL. Clinical obstetrics and gynecology. 2016; 59(2):320. PubMed PMID: 26992181. Mammographic Breast Density and Breast Cancer Risk: Implications of the Breast Density Legislation for Health Care Practitioners. Green VL. Clinical obstetrics and gynecology. 2016; 59(2):419-38. PubMed PMID: 26992182. The Impact of Axillary Lymph Node Surgery onÂ Breast Skin Thickening During and After Radiation Therapy for Breast Cancer. Torres MA, Yang X, Noreen S, Chen H, Han T, Henry S, Mister D, Andic F, Long Q, Liu T. International journal of radiation oncology, biology, physics. 2016; 95(2):590-6. PubMed PMID: 27055397. Tips and tricks of laparoscopic distal pancreatectomy for ductal adenocarcinoma. Kooby DA. Journal of hepato-biliary-pancreatic sciences. 2016; 23(6):E10-3. PubMed PMID: 27311802. Process and impact of an advance care planning intervention evaluated by bereaved surrogate decision-makers of dialysis patients. Song MK, Metzger M, Ward SE. Palliative medicine. 2016; PubMed PMID: 27272317. A Comprehensive Survey of Institutional Patient/Family Educational Practices for Newly Diagnosed Pediatric Oncology Patients: A Report From the Children's Oncology Group. Withycombe JS, Andam-Mejia R, Dwyer A, Slaven A, Windt K, Landier W. Journal of pediatric oncology nursing : official journal of the Association of Pediatric Oncology Nurses. 2016; PubMed PMID: 27283721. Biomarkers Predicting Pathological Complete Response to Neoadjuvant Chemotherapy in Breast Cancer. Li XB, Krishnamurti U, Bhattarai S, Klimov S, Reid MD, O'Regan R, Aneja R. American journal of clinical pathology. 2016; PubMed PMID: 27298399. Cryopreserved MSCs are Susceptible to T-cell Mediated Apoptosis which is partly Rescued by IFNÎ³ Licensing. Chinnadurai R, Copland IB, Garcia MA, Petersen CT, Lewis CN, Waller EK, Kirk AD, Galipeau J. Stem cells (Dayton, Ohio). 2016; PubMed PMID: 27299362. Physiological and pathophysiological bone turnover - role of the immune system. Weitzmann MN, Ofotokun I. Nature reviews. Endocrinology. 2016; PubMed PMID: 27312863. ACR Appropriateness Criteria(Â®) Locoregional therapy for resectable oropharyngeal squamous cell carcinomas. Beitler JJ, Quon H, Jones CU, Salama JK, Busse PM, Cooper JS, Koyfman SA, Ridge JA, Saba NF, Siddiqui F, Smith RV, Worden F, Yao M, Yom SS, . Head & neck. 2016; PubMed PMID: 27330003. Adenocarcinoma ex-goblet cell carcinoid (appendiceal-type crypt cell adenocarcinoma) is a morphologically distinct entity with highly aggressive behavior and frequent association with peritoneal/intra-abdominal dissemination: an analysis of 77 cases.Reid MD, Basturk O, Shaib WL, Xue Y, Balci S, Choi HJ, Akkas G, Memis B, Robinson BS, El-Rayes BF, Staley CA, Staley CA, Winer JH, Russell MC, Knight JH, Goodman M, Krasinskas AM, Adsay V. Modern pathology : an official journal of the United States and Canadian Academy of Pathology, Inc. 2016; PubMed PMID: 27338636. Determinants of radical cystectomy operative time. Filson CP, Tan HJ, Chamie K, Laviana AA, Hu JC. Urologic oncology. 2016; PubMed PMID: 27372282. ATAC-seq on biobanked specimens defines a unique chromatin accessibility structure in naÃ¯ve SLE B cells. Scharer CD, Blalock EL, Barwick BG, Haines RR, Wei C, Sanz I, Boss JM. Scientific reports. 2016; 6:27030. PubMed PMID: 27249108. Clinical outcomes in elderly patients with human papillomavirus-positive squamous cell carcinoma of the oropharynx treated with definitive chemoradiation therapy. Hanasoge S, Magliocca KR, Switchenko JM, Saba NF, Wadsworth JT, El-Deiry MW, Shin DM, Khuri F, Beitler JJ, Higgins KA. Head & neck. 2016; 38(6):846-51. PubMed PMID: 25899391. De novo CD5+ diffuse large B-cell lymphoma: Adverse outcomes with and without stem cell transplantation in a large, multicenter, rituximab treated cohort. Alinari L, Gru A, Quinion C, Huang Y, Lozanski A, Lozanski G, Poston J, Venkataraman G, Oak E, Kreisel F, Park SI, Matthews S, Abramson JS, Iris Lim H, Martin P, Cohen JB, Evens A, Al-Mansour Z, Singavi A, Fenske TS, Blum KA. American journal of hematology. 2016; 91(4):395-9. PubMed PMID: 26800311. Gene Variant Databases and Sharing: Creating a Global Genomic Variant Database for Personalized Medicine. Bean LJ, Hegde MR. Human mutation. 2016; 37(6):559-63. PubMed PMID: 26931283; PubMed Central PMCID: PMC4846518. Grating-based x-ray differential phase contrast imaging with twin peaks in phase-stepping curves-phase retrieval and dewrapping. Yang Y, Xie H, Cai W, Mao H, Tang X. Medical physics. 2016; 43(6):2855. PubMed PMID: 27277034. Impact of neck failure on survival in older patients with differentiated thyroid cancer. Marcus DM, Jiang R, Ward KC, Higgins KA, Saba NF, Wadsworth JT, Beitler JJ. Head & neck. 2016; 38(6):919-24. PubMed PMID: 26874073. Large Nonmelanoma Skin Tumors in Older Adults with Multiple Comorbidities: A Case-Control Study. Sargen MR, Martin I, Chen SC. Journal of the American Geriatrics Society. 2016; 64(6):1362-5. PubMed PMID: 27321624. Lessons learned using different mouse models during space radiation-induced lung tumorigenesis experiments. Wang J, Zhang X, Wang P, Wang X, Farris 3rd AB, Wang Y. Life sciences in space research. 2016; 9:48-55. PubMed PMID: 27345200. Pancreatic Ductal Adenocarcinoma is Spread to the Peripancreatic Soft Tissue in the Majority of Resected Cases, Rendering the AJCC T-Stage Protocol (7th Edition) Inapplicable and Insignificant: A Size-Based Staging SystemÂ (pT1: â‰¤2, pT2: >2-â‰¤4, pT3: >4 cm) is More Valid and Clinically Relevant. Saka B, Balci S, Basturk O, Bagci P, Postlewait LM, Maithel S, Knight J, El-Rayes B, Kooby D, Sarmiento J, Muraki T, Oliva I, Bandyopadhyay S, Akkas G, Goodman M, Reid MD,Krasinskas A, Everett R, Adsay V. Annals of surgical oncology. 2016; 23(6):2010-8. PubMed PMID: 26832882. Risk Management and Medico-Legal Issues in Breast Cancer. Ward CJ, Green VL. Clinical obstetrics and gynecology. 2016; 59(2):439-46. PubMed PMID: 27101242. Safety and Efficacy of Ureteral Stent Placement at the Bedside Using Local Anesthesia. Nourparvar P, Leung A, Shrewsberry AB, Weiss AD, Patil D, Atallah H, Ogan K, Carney KJ, Master VA. The Journal of urology. 2016; 195(6):1886-1890. PubMed PMID: 26804752. Short Communication: Hyperthyroidism in Human Immunodeficiency Virus Patients on Combined Antiretroviral Therapy: Case Series and Literature Review. Hsu E, Phadke VK, Nguyen ML. AIDS research and human retroviruses. 2016; 32(6):564-566. PubMed PMID: 26887978. Simulation of 3D tumor cell growth using nonlinear finite element method. Dong S, Yan Y, Tang L, Meng J, Jiang Y. Computer methods in biomechanics and biomedical engineering. 2016; 19(8):807-18. PubMed PMID: 26213205. The Milestones Really Do Add Value. Davis LP, Anderson JC, Vydareny K. Radiology. 2016; 279(3):670-2. PubMed PMID: 27183403. The Optic Canal Size Is Associated With the Severity of Papilledema and Poor Visual Function in Idiopathic Intracranial Hypertension. Bidot S, Clough L, Saindane AM, Newman NJ, Biousse V, Bruce BB. Journal of neuro-ophthalmology : the official journal of the North American Neuro-Ophthalmology Society. 2016; 36(2):120-5. PubMed PMID: 26580295. TNFRSF10C copy number variation is associated with metastatic colorectal cancer. Tanenbaum DG, Hall WA, Colbert LE, Bastien AJ, Brat DJ, Kong J, Kim S, Dwivedi B, Kowalski J, Landry JC, Yu DS. Journal of gastrointestinal oncology. 2016; 7(3):306-14. PubMed PMID: 27284460. Association of Socioeconomic Status and Race/Ethnicity With Treatment and Survival in Patients With Medullary Thyroid Cancer. Roche AM, Fedewa SA, Chen AY. JAMA otolaryngology-- head & neck surgery. 2016; PubMed PMID: 27254481. Effects of supplemental calcium and vitamin D on the APC/Î²-catenin pathway in the normal colorectal mucosa of colorectal adenoma patients. Liu S, Barry EL, Baron JA, Rutherford RE, Seabrook ME, Bostick RM. Molecular carcinogenesis. 2016; PubMed PMID: 27254743. Parental Perception of Neighborhood Safety and Children's Physical Activity. Galaviz K, Zytnick D, Cunningham SA, Kegler MC. Journal of physical activity & health. 2016; PubMed PMID: 27254849. Ratiometric Tension Probes for Mapping Receptor Forces and Clustering at Intermembrane Junctions. Ma VP, Liu Y, Blanchfield L, Su H, Evavold BD, Salaita K. Nano letters. 2016; PubMed PMID: 27192323. Results from an external proficiency testing program: 11 years of molecular genetics testing for myotonic dystrophy type 1. Richards CS, Palomaki GE, Hegde M. Genetics in medicine : official journal of the American College of Medical Genetics. 2016; PubMed PMID: 27253733. The Use of a Novel Immunohistochemical Triple Cocktail in the Subclassification of Resected Non-Small Cell Lung Carcinomas: A Comparative Study With Morphology and Traditional Immunohistochemistry. HooKim K, Chaudoir CS, Chaudhery SI, Reid MD. Applied immunohistochemistry & molecular morphology : AIMM / official publication of the Society for Applied Immunohistochemistry. 2016; PubMed PMID: 27258567. Targeting 6-phosphogluconate dehydrogenase in the oxidative PPP sensitizes leukemia cells to antimalarial agent dihydroartemisinin. Elf S, Lin R, Xia S, Pan Y, Shan C, Wu S, Lonial S, Gaddh M, Arellano ML, Khoury HJ, Khuri FR, Lee BH, Boggon TJ, Fan J, Chen J. Oncogene. 2016; PubMed PMID: 27270429. The Vanishing Twin Syndrome: Two cases of extreme malformations associated with vanished twins. Shinnick JK, Khoshnam N, Archer SR, Quigley PC, Robinson M, Keene S, Santore MT, Hill SJ, Patel B, Shehata B. Pediatric and developmental pathology : the official journal of the Society for Pediatric Pathology and the Paediatric Pathology Society. 2016; PubMed PMID: 27268154. Is There a Role for PET/CT Parameters to Characterize Benign, Malignant, and Metastatic Parotid Tumors? Kendi AT, Magliocca KR, Corey A, Galt JR, Switchenko J, Wadsworth JT, El-Deiry MW, Schuster DM, Saba NF, Hudgins PA. AJR. American journal of roentgenology. 2016; :1-6. PubMed PMID: 27276388. NHERF1 PDZ1 domain and IRBIT interact and mediate the activation of Na+/H+ exchanger NHE3 by angiotensin II. He P, Zhao L, No YR, Karvar S, Yun CC. American journal of physiology. Renal physiology. 2016; :ajprenal.00247.2016. PubMed PMID: 27279487. In Vitro Metabolic Stability and in Vivo Biodistribution of 3-Methyl-4-furoxancarbaldehyde Using PET Imaging in Rats. Pippin AB, Mohd Arshad ZH, Voll RJ, Nye JA, Ghassabian S, Williams CM, Mancini A, Liotta DC, Smith MT, Goodman MM. ACS medicinal chemistry letters. 2016; 7(6):563-7. PubMed PMID: 27326327. Programming Self-Assembly of DNA Origami Honeycomb Two-Dimensional Lattices and Plasmonic Metamaterials. Wang P, Gaitanaros S, Lee S, Bathe M, Shih WM, Ke Y. Journal of the American Chemical Society. 2016; PubMed PMID: 27224641. Improved Therapeutic Benefits by Combining Physical Cooling With Pharmacological Hypothermia After Severe Stroke in Rats. Lee JH, Wei L, Gu X, Won S, Wei ZZ, Dix TA, Yu SP. Stroke; a journal of cerebral circulation. 2016; PubMed PMID: 27301934. Downregulation of MicroRNA-206 promotes invasion and angiogenesis of triple negative breast cancer. Liang Z, Bian X, Shim H. Biochemical and biophysical research communications. 2016; PubMed PMID: 27318091. Lycopene, tomato products and prostate cancer-specific mortality among men diagnosed with nonmetastatic prostate cancer in the Cancer Prevention Study II Nutrition Cohort. Wang Y, Jacobs EJ, Newton CC, McCullough ML. International journal of cancer. 2016; 138(12):2846-55. PubMed PMID: 26830232. Epigenetic modification of OXT and human sociability. Haas BW, Filkowski MM, Cochran RN, Denison L, Ishak A, Nishitani S, Smith AK. Proceedings of the National Academy of Sciences of the United States of America. 2016; PubMed PMID: 27325757. Benefit of adjuvant radiotherapy after breast-conserving therapy among elderly women with T1-T2N0 estrogen receptor-negative breast cancer. Eaton BR, Jiang R, Torres MA, Kahn ST, Godette K, Lash TL, Ward KC. Cancer. 2016; PubMed PMID: 27328114. Rate of Second and Third Trimester Weight Gain and Preterm Delivery Among Underweight and Normal Weight Women. Sharma AJ, Vesco KK, Bulkley J, Callaghan WM, Bruce FC, Staab J, Hornbrook MC, Berg CJ. Maternal and child health journal. 2016; PubMed PMID: 27329188. Response to Kay Teschke. Re: Mesothelioma among Motor Vehicle Mechanics: An Updated Review and Meta-analysis. Garabrant DH, Alexander DD, Miller PE, Fryzek JP, Boffetta P, Teta MJ, Hessel PA, Craven VA, Kelsh MA, Goodman M. The Annals of occupational hygiene. 2016; PubMed PMID: 27328807. Enantioselective Intermolecular C-H Functionalization of Allylic and Benzylic sp(3) C-H Bonds Using N-Sulfonyl-1,2,3-triazoles. Kubiak 2nd RW, Mighion JD, Wilkerson-Hill SM, Alford JS, Yoshidomi T, Davies HM. Organic letters. 2016; PubMed PMID: 27333162. Pancreatic neuroendocrine tumors: Preoperative factors that predict lymph node metastases to guide operative strategy. Postlewait LM, Ethun CG, Baptiste GG, Le N, McInnis MR, Cardona K, Russell MC, Sarmiento JM, Kooby DA, Staley CA,Maithel SK. Journal of surgical oncology. 2016; PubMed PMID: 27334541. Human immunodeficiency virus lymphomas in the era of antiretrovirals: Is it finally time to change the discussion? Gunthel CJ, Lechowicz MJ. Cancer. 2016; PubMed PMID: 27337609. Adenocarcinoma ex-goblet cell carcinoid (appendiceal-type crypt cell adenocarcinoma) is a morphologically distinct entity with highly aggressive behavior and frequent association with peritoneal/intra-abdominal dissemination: an analysis of 77 cases. Reid MD, Basturk O, Shaib WL, Xue Y, Balci S, Choi HJ, Akkas G, Memis B, Robinson BS, El-Rayes BF, Staley CA, Staley CA, Winer JH, Russell MC, Knight JH, Goodman M, Krasinskas AM, Adsay V. Modern pathology : an official journal of the United States and Canadian Academy of Pathology, Inc. 2016; PubMed PMID: 27338636. REDLetr: Workflow and tools to support the migration of legacy clinical data capture systems to REDCap. Dunn Jr WD, Cobb J, Levey AI, Gutman DA. International journal of medical informatics. 2016; PubMed PMID: 27396629. Variations in cancer centers' use of cytology for the diagnosis of unresectable pancreatic cancer in the National Cancer Data Base. Gansler T, Fedewa SA, Lin CC, Jemal A, Ward EM. Cancer cytopathology. 2016; PubMed PMID: 27348076. Efficient and Reliable Production of Vectors for the Study of the Repair, Mutagenesis, and Phenotypic Consequences of Defined DNA Damage Lesions in Mammalian Cells. Petrova L, Gran C, Bjoras M, Doetsch PW. PloS one. 2016; 11(6):e0158581. PubMed PMID: 27362559.